Kenny talks to the young players. Derry City boss Kenny Shiels encouraged local youngsters to work hard to fulfil their potential during a football masterclass in Coleraine on Sunday morning. 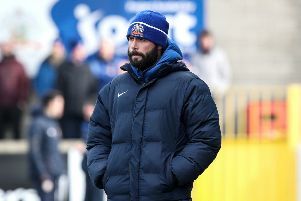 The former Coleraine manager was the guest coach at the Protech Soccer Academy run by Johnny Law at the Ulster University campus in Coleraine. Oran Kearney and son Luca 6, with 'grandad' Kenny Shiels. Kenny, who has built a reputation for developing young players during his managerial career, put twenty-three 13-16 year olds through their paces in a session which was enjoyed by everyone. “It’s obvious the boys have been given good coaching, they are really excellent,” said Kenny. Concluding his session, he told the boys: “Every day you get up you want to improve and get better so that you can reach your true potential. Current Bannsiders boss, Oran Kearney, made it a family affair by taking 17 players in the junior group session, including six-year-old son Luka. Johnny thanked both Oran and Kenny for taking time out of their busy schedules to visit the weekly sessions. Protech will now take a break for Christmas and will return on February 5. Any players aged five to 16 wanting to take part is asked to contact Johnny Law.